The C2ATI allows software developers to create interfaces to brokerages, to enable automatic trading of Collective2 signals. The design philosophy behind the C2ATI is that C2 manages much of the heavy lifting on the server side, so that your development project can be relatively "light-weight." For example, C2 keeps track of whether a particular customer receives a fill on an opening order, and - depending on whether a fill occurred, and at what quantity -- will automatically adjust the closing signals needed. Indeed, C2ATI has been designed so that very little (perhaps no) state information needs to be stored on your local machine. Your job, essentially, is to write a translation interface between C2 and an end-user's broker account. You can view the C2ATI documentation right away. However, in order to engage in any real-life testing, you'll need to enable your Collective2 account so that it "sees" the C2ATI Testing platform. Some explanation may be useful here. When you create your software program, it will log in to a C2ATI server, and will announce itself using a C2 username and password. It can then request a list of trading systems that the user in question specifically wishes to AutoTrade. Note that the customer must give explicit permission for AutoTrading to occur on a particular system, and he must select that the trading system in question be "routed" to a particular broker. This permission is given in the Setup AutoTrading page, here on C2. 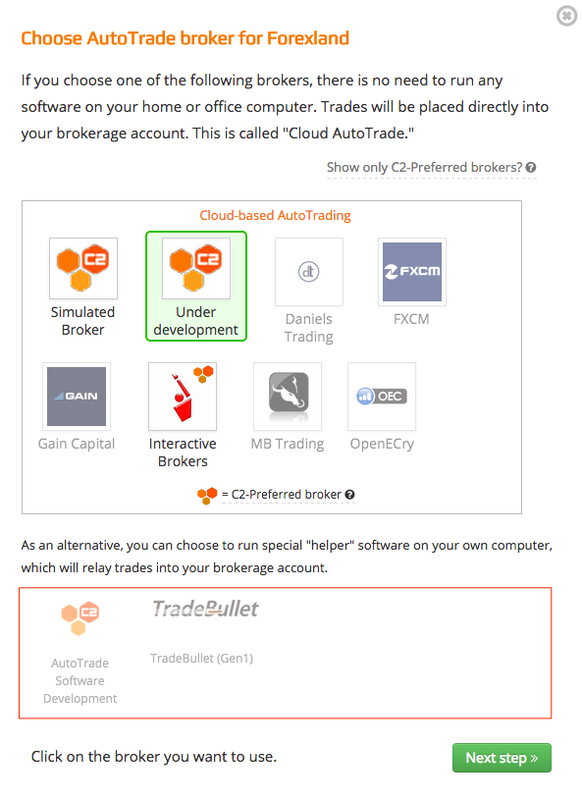 The Setup AutoTrading page contains a list of available brokers and C2-compatible software programs. When your software is complete, we can add your software's/brokerage name to the list that appears below. However, until that time, we ask that you develop using our "C2 Test Client." So, in order to make the name C2 Test Client appear in the drop-down list pictured above, you need to send us an email (help@collective2.com) asking for access. Make sure you include in your email the email address you use to login to C2 (if it is not the same as the email address used to send your request). Once your account is enabled, you will see a new "broker" appear on the drop-down list. While testing and developing your software, you can now use the "TESTCLIENT" client name when your software logs in to the C2ATI server. Any AutoTrading permissions you've set up using the 'C2 Test Client' broker (shown above) will be transmitted to your software. The C2ATI is completely free for non-commercial private use (that is, for those trading their own accounts). If you are a broker or service provider who wishes to enable C2 AutoTrading for your own customers, please contact us. Feel free to download the C2ATI documentation immediately. When you are ready to begin development, email us and ask for your C2 account to be C2ATI enabled. As always, we are here to support your software development efforts. If possible, please post queries on our public C2 Forums, so that others can learn from your question (and our answer). If you prefer private queries, you can send an email to help@collective2.com.